It is so hard to believe that as of this past Saturday, I have completed the Kentucky Derby Festival mini-Marathon four times!!! Each one has been a unique experience and every year following 2008, I have just a tiny bit of regret that I did not train the way I’m “supposed to” for this race. In 2008, I had only been running a few months when I decided to train for the mini. I was so dedicated! I followed the program religiously and ran the entire thing without stopping and had a great finishing time. While I’m very proud of this accomplishment, I have found it hard to go back to that mentality since or even set a time goal near the one I had in 2008. Because training for and completing that race burned me out, physically and mentally. I never wanted to run again. And when I did, I couldn’t wait for it to be over. I can’t pinpoint one thing in particular that made it seem that way but I took me well over a year to love running again (I walked the mini in 2009). Ever since then I have had a more laid back approach to half marathon “training.” I want to have fun, not get sick or injured and not feel the pressure to keep beating myself. So I basically just run 2-3 times a week, usually around 3-5 miles and then I try to do a long run here and there. The Triple Crown of Running really does help prepare you for the mini too. But this year, I missed the Papa John’s 10 miler and never ran more than 8.5 miles from January on. Oops. 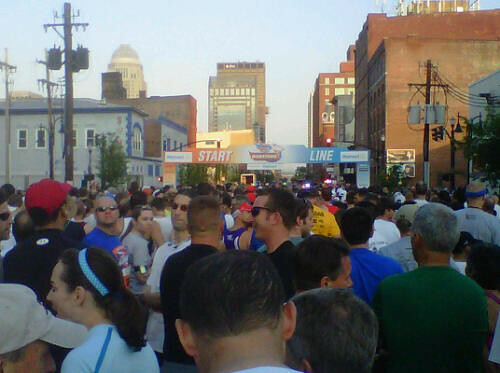 But, even as Saturday grew closer, I never dreaded signing up for the race again. When I went to get my packet on Thursday afternoon, it felt real and I remembered why I found running and races so exciting to begin with. There is nothing quite like crossing that finish line. Especially when just 4.25 short years ago, I was a very unhappy, unhealthy 216 lb version of myself. It’s easy to forget those days sometimes. I wasn’t far back from the front so almost as soon as I lined up it was time to cross the starting line. I had in my mind that I would at least run the first 3 miles and stop at every other water stop. When I reached mile 4, I stopped to use the port-a-potty, which took at least 5 minutes off of my time but it was well worth it. It was starting to get warmer outside so I took my long sleeved shirt off and tied it around my waist. I got a drink of water and then started running again. I was able to run the first 7 miles with no walking breaks, impressive for not much training! I felt my strongest from miles 5-7, like I was floating on air. During miles 8-11, I walked for 30 seconds to a minute whenever I felt my running pace slowing significantly. You know like when you are jogging so slow that people walking are passing you? Then we would pass a cheering crowd and I would suddenly have the energy to start running again. It was getting even warmer outside, so I switched from every other water stop to all of them. Not long after that, I walked again, because I knew that the finish of this race was elusive. When you come around that last turn you think “Yes! I am almost there!” but I have learned in years past that if you start sprinting too soon, you won’t make it. So I waited until the finish line was in clear view, then I picked it up a little and then started running my fastest to the finish line, passing a lot of people in the process. I didn’t hurt anymore, I felt strong and of course teared up as I came across that finish line for the 4th time, thinking of the “old” me and how far I had come in this journey called life. This is my third fastest half marathon time but my second best for this particular race (I ran the Louisville Half Marathon back in October). While I ran my first mini in 2:12:08, I decided not to look at this race as 42 minutes slower but rather this time is a major improvement on the last two years (3:07 in 2010 and 3:30 in 2009). Negativity is never the way to go! The crowds cheering everywhere, thank God for you people. I want to be on the “other side” one of these days to cheer someone on! I’m sure there are more and if I remember anything else, I will add it to the list! 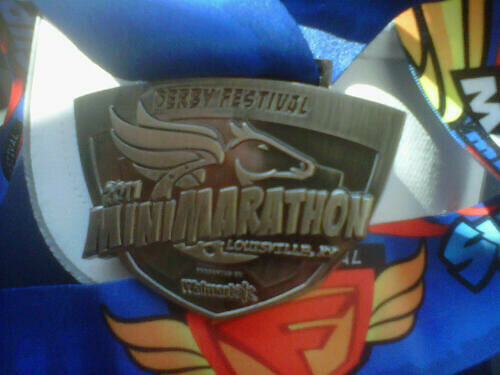 I’m happy to say that thanks to a hot shower, Advil and proper refueling, I am not very sore from this race. A little achy in the quads but that’s it. I also iced my knees, shins, ankles and feet but accidentally forgot that other important part of my leg. Oops! I’m not sure. Part of me wants to give “real” training another shot and either try to PR the half marathon or perhaps complete my first full marathon! Part of me wants to just stick to shorter races like 5 and 10k’s and work on speed. And finally, part of me wants to take some time off, re-evaluate my goals and be a spectator for awhile.